LOOK at my NEW T-shirt! I am not CERTAIN but I think a TEE shirt is for DRINKING tea in. Or maybe for GOLFING. Do I look MANLY in this shirt? This is ANOTHER way you can wear a TEE shirt. WAIT! 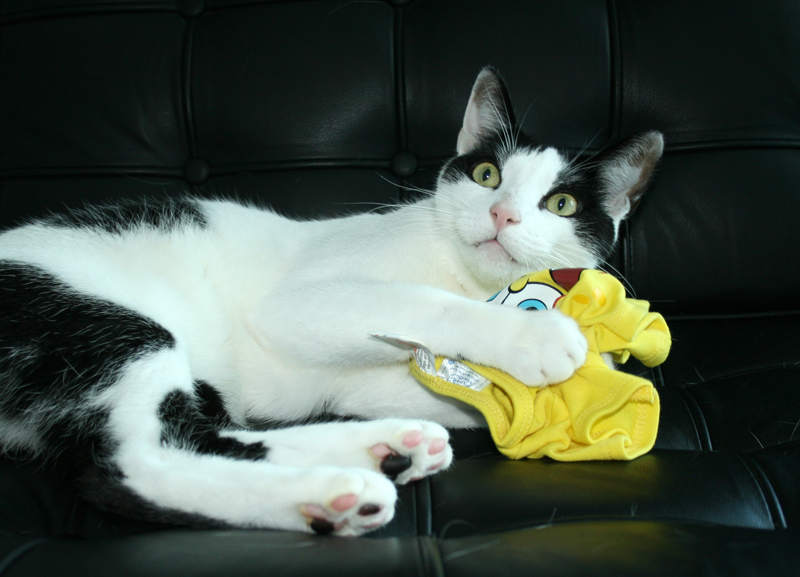 Please do not TAKE AWAY my SPONGEBOB tee shirt. I have grown ATTACHED to it! Harley, you did some pretty creative things with that t-shirt - I wonder if Daisy is jealous? You are CRAY-ZEE, Harley! My husband has Spongebob Squarepants shorts. But he doesn't wear them on his head. That we know of. I wouldn't exactly call you manly in that shirt. We LOVE that last photo, Harley! You look great in that T-Shirt! I like that cornholo photo--very cute! So glad you like the t-shirt--had to laugh at that last photo! You crack us up. 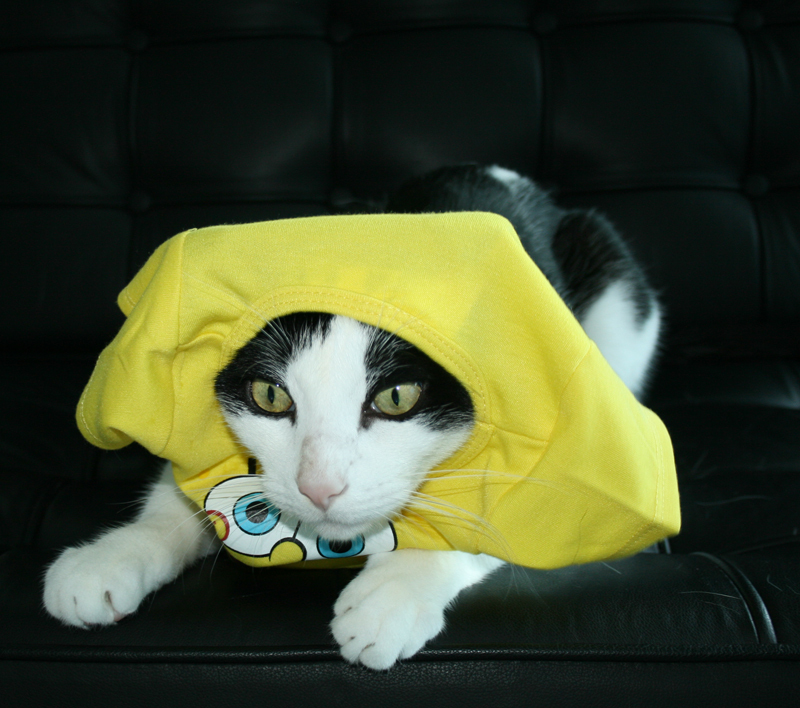 H - I think that is a t-shirt for taking nip in and rolling around and having a good time in. Looking good, Harley. That colour suits you. That is one fancy shirt Harley. It certainly does make you look manly. And for sure don't give up that shirt. That is yours. Take care all of you. Harley you look so cute in the last photo clutching your t-shirt. Oh Harley! You crack us up! But we think that shirt looks great on you no matter how you want to wear it. how can you not look manly in a spongebob shirt? That teeshirt suit´s you furry well , Harley ! And Spongebob! We all like him. I like the shirt on your head but the Cornhulio made MomKatt scream with laughter! 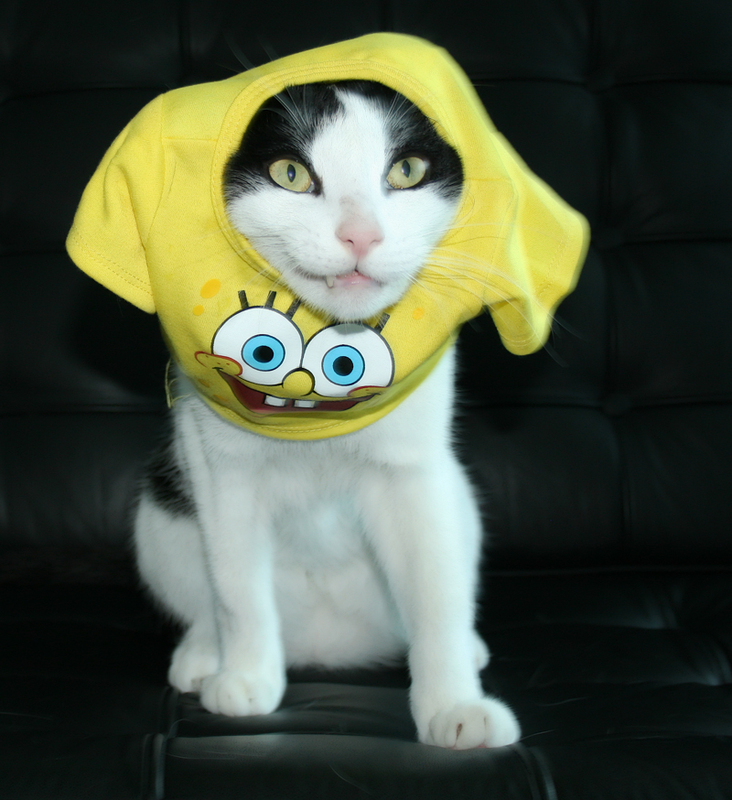 MOWZERS dood, we mancats need our own t-shirts so we can do Cornholio impressions too! Our dad would LAFF!! I like that you are holding it close. I sleep with my squishy pillow every night. It is comforting. dood...we iz lovin de semi dracula look in pick sure three !!! Cornholio ... Bwahahahaha! That's a good one, Harley! The t-shirt suits you purrfectly ! You make a GREAT cornholio! I'm not sure how manly you look, but the shirt is awesome. that's all the kids are wearing nowadays harley. CORNHOLIO IS KING! LONG LIVE CORNHOLIO! We think the first is great foe golfin! We hear ya can wear almost annything golfin. Dood...that shirt ROCKS and you look great in it. How could it not be awesome? 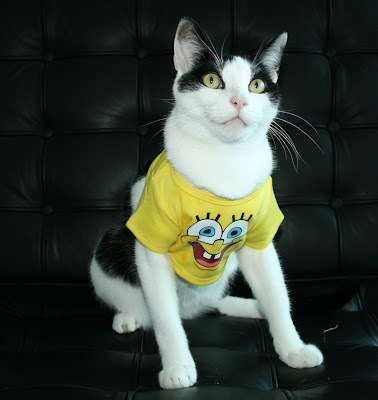 IT'S SPONGEBOB! He lives in a pineapple UNDER THE FREAKING SEA! Don't let anyone take it away, EVER! That's a very cute tee shirt, Harley! Or should I say tea shirt. Hehehe. Your T shirt suits you Harley, but I think you are crazy pants! I had to google Cornholio and now I know you are crazy!! Hee hee hee, you're funny. I think Tee shirts are for drinking catnip tee in!